Anglo-Australian astronomy is much the poorer for the passing of John Dawe, who lost his brave fight against pancreatic cancer on 15 November 2004. John played a major role in the astronomical life of both the UK and Australia over many years, and won the admiration and respect of scientists from all branches of the community. John’s interest in astronomy went back to his childhood in England, where he built a telescope while a pupil at Barton Peveral Grammar School in Eastleigh, Hampshire. He eventually showed himself to be an outstanding student, winning a scholarship to University College, London, from where he gained both BSc and PhD degrees in astrophysics. In 1967, John moved to the University of Leicester to take up a lectureship in the Faculty of Science, and followed that some three years later with an adventurous move to Barbados, where he worked in the University of the West Indies. By 1972, John and his wife Pamela had two baby daughters, both of whom had managed to arrive while John was out of the country. But the year also saw the family move to Scotland, as John became first a Research Fellow and then a permanent staff member of the Royal Observatory, Edinburgh. It was during this period that John’s association with Australia began, as he was one of several commissioning astronomers on the Anglo-Australian Telescope during the mid-seventies. John’s research work at this time was broad-based, but its overall flavour centred on the theme of the galactic and extra-galactic distance scales. His work with Victor Clube on the absolute magnitudes of RR Lyrae stars, for example, is still cited in the literature today. But John was also recognised as a person with strong scientific management potential, and it was this that brought him to Australia on a more permanent basis in 1978. In those days, the UK Schmidt Telescope at Siding Spring was an outstation of the Royal Observatory, Edinburgh, and the role of Astronomer-in-Charge was a key position in maintaining the scientific productivity of the telescope. John took the reins after deputising for a couple of years, and entered what became perhaps the happiest period of his scientific life. Though photographic surveys were the telescope’s main stock-in-trade, John was always quick to see its potential in non-survey work, and he played a part in several major photographic projects. More far-reaching, though, was his recognition of the possibilities offered by optical fibres in wide-field spectroscopy. This was then a brand-new technique that has today revolutionised the way astronomers look at the Universe. It was principally John’s enthusiasm and insight that led to the development of FLAIR, the UK Schmidt’s first multi-fibre system and a precursor of the modern 6dF. By 1984, John and Pamela had decided to make Coonabarabran their permanent home, so John left the Schmidt to become ANU Siding Spring Observatory Manager, a post he held for 11 years. During that time, he played a major part in setting up the dark-sky protection protocol for Siding Spring that eventually became the Orana Regional Environmental Plan No. 1. He also served on the Council of the Astronomical Society of Australia. As always, John threw himself wholeheartedly into every aspect of astronomy, and earned a special place in affections of the local community with his portrayals of a jovial Edmond Halley during the run-up to the comet’s apparition in 1986. John took early retirement in 1995, but remained far from inactive, fulfilling roles as diverse as a Regional Census Manager and Chair of the Coonabarabran Bypass Committee. In May 2001, he was diagnosed with pancreatic cancer, and underwent a lengthy and difficult period of treatment. But he recovered so well that exactly two years later, he was able to return to the UK Schmidt as an observer for the international RAVE (RAdial Velocity Experiment) project. 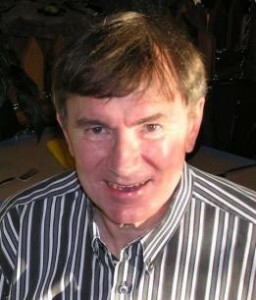 John was thus able to contribute significantly to studies that had a direct relationship with his work on galactic structure thirty years earlier. He was thrilled to be able to observe again with his favourite telescope, but ill health finally forced him to resign in mid-2004. John will be remembered for his irrepressible joie de vivre, and as a man who delighted in his family and many friends. He always had a refreshingly original view of the world not to mention the Universe at large. Above all, he was a true humanitarian and a true gentleman. He is survived by Pamela, their daughters Natasha and Lara, and their families. It was with both laughter and tears that family and friends gathered to celebrate John’s life at a lively wake in Coonabarabran on 23 November, just as he had requested. It was John’s wish that we should not be gloomy about his passing, but we will all miss him deeply.